After 18 years of active sea service, Captain Jahangir Mahmud Rakib, Master Mariner (U.K.), MNI, joined International Maritime Academy as Nautical Instructor on 1st of March 2010. He joined Marine Academy, Chittagong as a Nautical Cadet of 26th Batch (Academy Number 1336) and passed out in the year 1992. The same year he joined at sea and started his sea-going career with Bangladesh Shipping Corporation as a Deck Cadet. 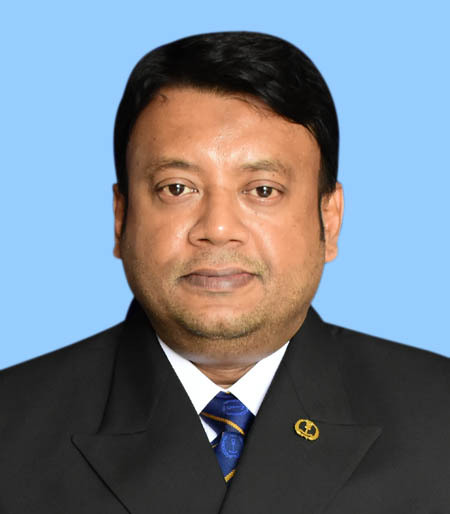 He served in Bangladesh Shipping Corporation until 1995. From 1995 to 2010 he served in Pacific International Lines (Pte) Ltd. Singapore in various officer ranks. He obtained Master command in the year 2006 and after serving for 5 years as Master quit sea in the year 2010. He obtained all his professional certificates of competency from U.K.
Capt. Rakib served most of his sea carrier including entire 1st mate and Command periods in Container vessels. He also served in General Cargo vessel and Tanker for short period. As Master, he took the delivery of last vessel in his sea carrier from Dalian Shipyard, China in 2009. Capt. Rakib is a Permanent Resident (PR) of Singapore and a member of Singapore Maritime Officer’s Union (SMOU). He is also one of the Founders and Directors of Uttara Crescent Hospital, Uttara Crescent Medical Training Institute and Uttrara Medical College and Hospital. Capt. Rakib has been promoted to the rank of Senior Maritime Instructor from 01 January 2012. Capt. Jahangir Mahmud Rakib dreams that the Bangladeshi sailors will lead the entire sailor community of the world. Currently he is serving in International Maritime Academy. He is happily married since 1999 and is blessed with a son and a daughter.